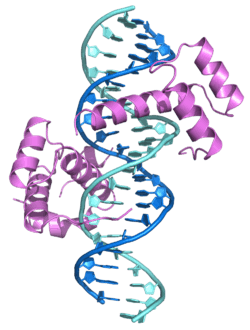 Homeobox protein Hox-B1 is a protein that in humans is encoded by the HOXB1 gene. This gene belongs to the homeobox family of genes. The homeobox genes encode a highly conserved family of transcription factors that play an important role in morphogenesis in all multicellular organisms. Mammals possess four similar homeobox gene clusters, HOXA, HOXB, HOXC and HOXD, located on different chromosomes, consisting of 9 to 11 genes arranged in tandem. This gene is one of several homeobox HOXB genes located in a cluster on chromosome 17. HOXB1 has been shown to interact with PBX1. 1 2 "Entrez Gene: HOXB1 homeobox B1". ↑ Berthelsen J, Zappavigna V, Ferretti E, Mavilio F, Blasi F (Mar 1998). "The novel homeoprotein Prep1 modulates Pbx-Hox protein cooperativity". EMBO J. 17 (5): 1434–45. doi:10.1093/emboj/17.5.1434. PMC 1170491 . PMID 9482740. ↑ Piper DE, Batchelor AH, Chang CP, Cleary ML, Wolberger C (Feb 1999). "Structure of a HoxB1-Pbx1 heterodimer bound to DNA: role of the hexapeptide and a fourth homeodomain helix in complex formation". Cell. 96 (4): 587–97. doi:10.1016/S0092-8674(00)80662-5. PMID 10052460. Acampora D, D'Esposito M, Faiella A, Pannese M, Migliaccio E, Morelli F, Stornaiuolo A, Nigro V, Simeone A, Boncinelli E (1989). "The human HOX gene family". Nucleic Acids Res. 17 (24): 10385–402. doi:10.1093/nar/17.24.10385. PMC 335308 . PMID 2574852. Boncinelli E, Acampora D, Pannese M, D'Esposito M, Somma R, Gaudino G, Stornaiuolo A, Cafiero M, Faiella A, Simeone A (1989). "Organization of human class I homeobox genes". Genome. 31 (2): 745–56. doi:10.1139/g89-133. PMID 2576652. Guazzi S, Lonigro R, Pintonello L, Boncinelli E, Di Lauro R, Mavilio F (1994). "The thyroid transcription factor-1 gene is a candidate target for regulation by Hox proteins". EMBO J. 13 (14): 3339–47. PMC 395231 . PMID 7913891. Miano JM, Firulli AB, Olson EN, Hara P, Giachelli CM, Schwartz SM (1996). "Restricted expression of homeobox genes distinguishes fetal from adult human smooth muscle cells". Proc. Natl. Acad. Sci. U.S.A. 93 (2): 900–5. doi:10.1073/pnas.93.2.900. PMC 40155 . PMID 8570656. Apiou F, Flagiello D, Cillo C, Malfoy B, Poupon MF, Dutrillaux B (1996). "Fine mapping of human HOX gene clusters". Cytogenet. Cell Genet. 73 (1-2): 114–5. doi:10.1159/000134320. PMID 8646877. Berthelsen J, Zappavigna V, Ferretti E, Mavilio F, Blasi F (1998). "The novel homeoprotein Prep1 modulates Pbx-Hox protein cooperativity". EMBO J. 17 (5): 1434–45. doi:10.1093/emboj/17.5.1434. PMC 1170491 . PMID 9482740. Piper DE, Batchelor AH, Chang CP, Cleary ML, Wolberger C (1999). "Structure of a HoxB1-Pbx1 heterodimer bound to DNA: role of the hexapeptide and a fourth homeodomain helix in complex formation". Cell. 96 (4): 587–97. doi:10.1016/S0092-8674(00)80662-5. PMID 10052460. Jungbluth S, Bell E, Lumsden A (1999). "Specification of distinct motor neuron identities by the singular activities of individual Hox genes". Development. 126 (12): 2751–8. PMID 10331985. Jacobs Y, Schnabel CA, Cleary ML (1999). "Trimeric association of Hox and TALE homeodomain proteins mediates Hoxb2 hindbrain enhancer activity". Mol. Cell. Biol. 19 (7): 5134–42. PMC 84356 . PMID 10373562. Faiella A, Zortea M, Barbaria E, Albani F, Capra V, Cama A, Boncinelli E (1998). "A genetic polymorphism in the human HOXB1 homeobox gene implying a 9bp tandem repeat in the amino-terminal coding region. Mutations in brief no. 200. Online". Hum. Mutat. 12 (5): 363. PMID 10671062. Mikkola I, Bruun JA, Holm T, Johansen T (2001). "Superactivation of Pax6-mediated transactivation from paired domain-binding sites by dna-independent recruitment of different homeodomain proteins". J. Biol. Chem. 276 (6): 4109–18. doi:10.1074/jbc.M008882200. PMID 11069920. Ingram JL, Stodgell CJ, Hyman SL, Figlewicz DA, Weitkamp LR, Rodier PM (2000). "Discovery of allelic variants of HOXA1 and HOXB1: genetic susceptibility to autism spectrum disorders". Teratology. 62 (6): 393–405. doi:10.1002/1096-9926(200012)62:6<393::AID-TERA6>3.0.CO;2-V. PMID 11091361. Di Rocco G, Gavalas A, Popperl H, Krumlauf R, Mavilio F, Zappavigna V (2001). "The recruitment of SOX/OCT complexes and the differential activity of HOXA1 and HOXB1 modulate the Hoxb1 auto-regulatory enhancer function". J. Biol. Chem. 276 (23): 20506–15. doi:10.1074/jbc.M011175200. PMID 11278854. Li J, Tabor HK, Nguyen L, Gleason C, Lotspeich LJ, Spiker D, Risch N, Myers RM (2002). "Lack of association between HoxA1 and HoxB1 gene variants and autism in 110 multiplex families". Am. J. Med. Genet. 114 (1): 24–30. doi:10.1002/ajmg.1618. PMID 11840501. Kosaki K, Kosaki R, Suzuki T, Yoshihashi H, Takahashi T, Sasaki K, Tomita M, McGinnis W, Matsuo N (2002). "Complete mutation analysis panel of the 39 human HOX genes". Teratology. 65 (2): 50–62. doi:10.1002/tera.10009. PMID 11857506. Fognani C, Kilstrup-Nielsen C, Berthelsen J, Ferretti E, Zappavigna V, Blasi F (2002). "Characterization of PREP2, a paralog of PREP1, which defines a novel sub-family of the MEINOX TALE homeodomain transcription factors". Nucleic Acids Res. 30 (9): 2043–51. doi:10.1093/nar/30.9.2043. PMC 113854 . PMID 11972344. Subramaniam N, Campión J, Rafter I, Okret S (2003). "Cross-talk between glucocorticoid and retinoic acid signals involving glucocorticoid receptor interaction with the homoeodomain protein Pbx1". Biochem. J. 370 (Pt 3): 1087–95. doi:10.1042/BJ20020471. PMC 1223238 . PMID 12487626.